PT Perkebunan Nusantara XII - PTPN XII or PTPN 12 is a leading and reputable plantation and agribusiness company in Indonesia. 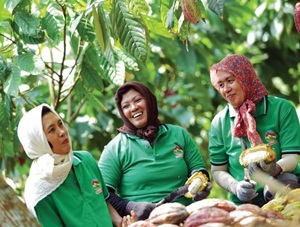 Based in Surabaya East Java, PTPN 12 manages a plantation area of 80,000 hectares and is spread throughout East Java consisting of 34 garden units. PT Perkebunan Nusantara XII is a holding member of state-owned agricultural holding company PT Perkebunan Nusantara III (Persero) or PTPN 3 Group. At present, PTPN 3 Group is the majority shareholder at PT Perkebunan Nusantara XII, with 90% of ownership. Other 10% remaining shares in PTPN 12 was owned by the Government of Indonesia. PT Perkebunan Nusantara XII was established in 1996 as a merger results of 3 state plantation companies, namely ex PT Perkebunan XXIII (Persero), PT Perkebunan XXVI (Persero) and PT Perkebunan XXIX (Persero). According to PT Perkebunan Nusantara XII Annual Report 2015 as cited by JobsCDC.com, PTPN 12 reported total revenue of Rp 1,076.44 billion in 2016. This number is down from Rp 1,132.71 billion in 2015. Referring to its annual report, PTPN 12 was able to record total profit after income tax of Rp 65.17 billion by the end of 2016. This went up by Rp 34.62 billion or 113.34% compared to the pro t in 2015 mainly due to the decline in operational expenses in 2016. Indonesian Citizen (WNI), maximum age of 28 years old on 1 January 2018. Minimum Bachelor Degree or equivalent (S1/D4) with major according to the above formation requirements. The candidate with prior experience in the related field is preferred, as indicated by Job Certificate. Considering the nature of the work undertaken for majors 1-7 required male applicants. Psychically and mentally healthy and drug free as indicated by medical certificate. Never punished for committing a crime, as indicated by SKCK. Never dismissed with disrespect from government or private agencies or entities. JobsCDC.com now available on android device. Download now on Google Play here. Please be aware of recruitment fraud. The entire stage of this selection process is free of charge. PT Perkebunan Nusantara XII - Professional Program PTPN Group April 2018 will never ask for fees or upfront payments for any purposes during the recruitment process such as transportation and accommodation.